You may well wonder why it’s important at all to locate Middle-earth in J.R.R. Tolkien’s Lord of the Rings. Does it really matter whether Middle-earth is a future world in another galaxy or a Europe long gone? Would it really detract from your enjoyment of Bilbo’s journey to the Lonely Mountain or Frodo’s quest from the Shire to Mount Doom if you found out that Middle-earth were nowhere on this earth? Tolkien drew Middle-earth so well in The Hobbit and told the story of The Lord of the Rings so tightly that it wouldn’t matter a whit if he had started off either story with the now famous declaration from George Lucas’ Star Wars saga, “A long time ago, in a galaxy far, far away . . .” On the other hand, coming to know how much Middle-earth owes to past European sagas, legends, and languages can only enhance appreciation of Tolkien’s works and deepen understanding of their many lessons. Associating Middle-earth with our world and not some alien planet or invisible dimension was very important to Tolkien. When pressed for the location of Middle-earth (as fans and critics continually did), Tolkien often replied that Middle-earth most definitely refers to lands of this world. In his letter commenting on a review of The Lord of the Rings by W. H. Auden, he wrote, “Middle-earth is not an imaginary world.” He then declared that his Middle-earth is “the objectively real world” as opposed to an imaginary world, such as Fairyland, or invisible ones, such as Heaven or Hell. In another letter responding to a draft of a Daily Telegraph article for which he was interviewed, Tolkien said that the stories in The Hobbit and The Lord of the Rings take place in the “north-west of ‘Middle-earth,’ equivalent to the coastlands of Europe and the north shores of the Mediterranean.” He then went on to fix some of the primary locations in his books by stating that if you placed Hobbiton and Rivendell at the latitude of Oxford (which was his intention), then Minas Tirith, some 600 miles south in Gondor, would be at approximately the same latitude as Florence, Italy. This puts the Mouths of the river Anduin and the ancient Gondorian city of Pelagir at about the same latitude as the fabled city of Troy (made famous in Homer’s heroic epic poem the Iliad and located on the west coast of modern-day Turkey). To get an idea of these spatial relationships, see Figure 1, which shows the western coastline of Middle-earth and points out the specific parallel locations that Tolkien pinpointed in his letter. 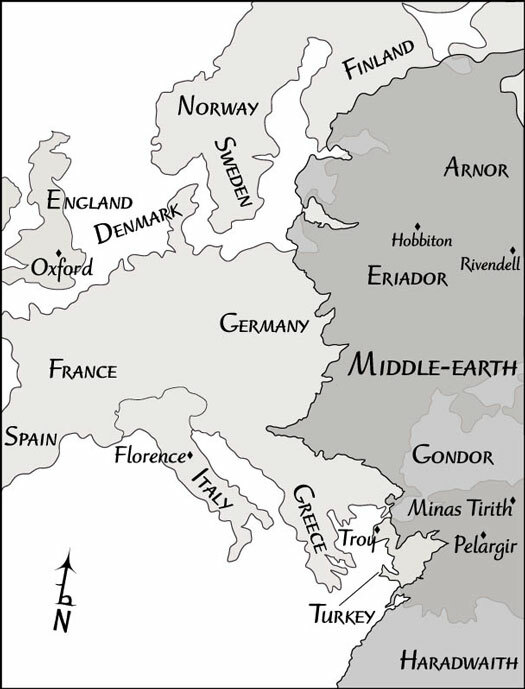 From this map, you’d be hard pressed to match any of Middle-earth’s physical features with those of modern-day Europe. Tolkien would have explained this obvious discrepancy as the result of changes in coastal geography during the time that has elapsed since his epic adventures took place. You might look at it as the difference between Earth’s Jurassic age and the Middle Ages — not too much looks the same, but it’s the same old Earth. Figure 1: Middle-earth’s coastline superimposed on Western Europe. This reads, “Hail, Earendel, the brightest of angels sent to the world of men!” In this early form, Middle-earth was not only the inhabited lands in the midst of the encircling seas, but also the middle ground between Heaven above and Hell below. This vertical dimension of the early European Christian Middle-earth is entirely missing from Tolkien’s — even though you’d be hard pressed to find a more devout Catholic Christian. At the time when The Hobbit and The Lord of the Rings take place, the inhabited lands of Middle-earth are surrounded on three sides by wastelands and on the west by open sea. To the north lies the Ice Bay of Forochel, and beyond that is the frozen Northern Waste; to the east is Rhûn, populated by the barbaric Easterlings. To the south you find the vast deserts of Harad, populated by dark-skinned peoples called the Haradrim (“Southerns”). In The Lord of the Rings, both Easterlings and Southrons often make war on the free peoples of Middle-earth and are allied with Sauron, Dark Lord of the eastern realm of Mordor, who is the greatest threat to freedom in Middle-earth. On the west, many of the lands of Middle-earth, just like many lands of Europe, have borders that adjoin the sea. According to Tolkien’s thinking, at the time of The Hobbit and The Lord of the Rings, you could sail west and not find any other land masses (you certainly wouldn’t discover the Americas). In earlier ages, though, sailing directly west would bring you to the island of Númenor, the ancient homeland of the people who end up settling the northern and southern coasts of Middle-earth. And west of Númenor lay the continent of Aman — the so-called Blessed Realm or Undying Lands. Aman is where two types of immortal beings, the Valar and Elves, dwell together. By the Third Age, the one in which The Hobbit and The Lord of the Rings take place, the island of Númenor has sunk beneath the sea, and Aman, removed from the physical plane of the world, is accessible only by the magic White Ships of the Elves. Viewed from this perspective, you can start to understand how the peoples of Tolkien’s Middle-earth perceive their lands as being encircled by limiting forces, some of which are hostile. This viewpoint is perhaps not so unlike the Anglo-Saxons before they came to Britain, when they still dwelt along the northwestern coast of Europe in the lands now known as Denmark and northwest Germany. At that time, they were surrounded on three sides by potentially hostile tribes and the open sea on the other. The situation didn’t change much when they got to England, except that the sea was mostly at their back with the hostile Celts in front and on either side of them. Much of the orientation of Middle-earth’s geography may be rooted in the perspective of Tolkien’s Anglo-Saxon ancestors, whose language he knew so well.